The oldest temple in Chiang Mai town, Wat Chiang Man was built in 1296 by King Mengrai, the founder of Chiang Mai. The temple is famous for its Lanna-style chedi supported by rows of elephant-shaped buttresses and an ancient and invaluable Buddha image named Phra Kaeo Khao. Wat Chiang Man is situated off of Ratchapakhinai Road in the northeast corner of the old city. 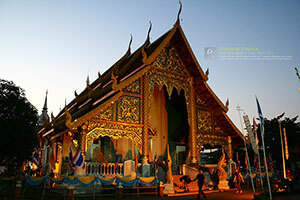 - Wat Chiang Man is situated off of Ratchapakhinai Road in the northeast corner of the old city.